Admission to the bar in the United States is the granting of permission by a particular court system to a lawyer to practice law in that system. Each U.S. state and similar jurisdiction has its own court system and sets its own rules for bar admission , which can lead to different admission standards among states. In most cases, a person who is "admitted" to the bar is thereby a "member" of the particular bar. 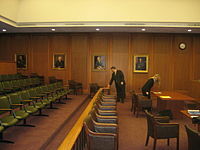 Admission to the bar in the United States is the granting of permission by a particular court system to a lawyer to practice law in that system. Each U.S. state and similar jurisdiction (e.g., territories under federal control) has its own court system and sets its own rules for bar admission (or privilege to practice law), which can lead to different admission standards among states. In most cases, a person who is "admitted" to the bar is thereby a "member" of the particular bar. In the canonical case, lawyers seeking admission must earn a Juris Doctor degree from a law school approved by the jurisdiction, and then pass a bar exam administered by it. Typically, there is also a character and fitness evaluation, which includes a background check. However, there are exceptions to each of these requirements. A lawyer who is admitted in one state is not automatically allowed to practice in any other. Some states have reciprocal agreements that allow attorneys from other states to practice without sitting for another full bar exam; such agreements differ significantly among the states.